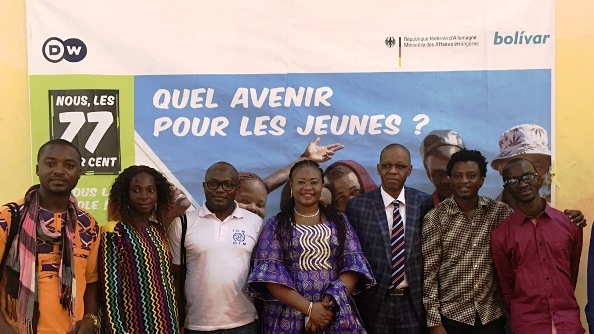 At a recent town hall debate in Mamou, a small city in central Guinea, DW’s project supporting African youth, The 77 percent, brought together around 600 people to discuss young people’s challenges and dreams for the future. The work done by local media in cooperation with DW conveys an important message to young Africans that leaving home is not the only solution for the future. Dialogue, communication and sharing ideas can give young people hope that they are not alone in dealing with challenges. The DW project, The 77 percent, focuses on a new generation of Africans, 77 percent of whom are under the age of 35. With web-videos, online projects and direct reporting from different regions in Africa, DW is trying to paint a picture of what life is like for African youth. In identifying the problems that many people share, solutions can become clearer. Since 2016, DW, in cooperation with local media partners, has visited many communities in Sub-Saharan Africa to address the problem of mass-migration and listen to reasons why young Africans are leaving home. The town hall debate in Mamou was conducted in cooperation with the German foreign ministry and Radio Bolivar FM, and was one of the most successful events to date. More 77 percent debates are planned soon for Mali and Nigeria.